The stunning Kelburn Castle & Country Centre is a vast estate covering an area of over 3,500 acres, with spectacular views over the islands of the Firth of Clyde. At the heart of the family-owned property is the 13th Century castle, which has unique paintings on its outside walls painted by a team of Brazilian artists. The estate near Largs, Ayrshire attracts visitors because of its dramatic walks, breathtaking waterfalls and amazing flora in the sheltered gardens. 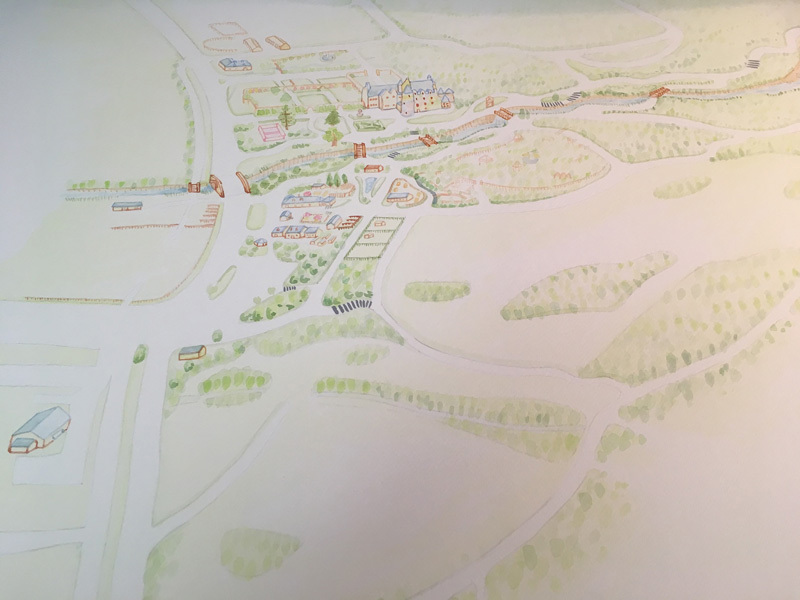 We were approached by the client to create an A1 and A4 illustrated map in watercolour showing the new accommodation and extended walks now available to visitors. As the estate covers such a large area it is crucial that visitors are able to navigate their way around on their own and easily find all the attractions that the estate has to offer. The map was created by collecting as much data on the landscape as possible. We used QGIS to work out the best aspect for the map. Then we sketched the map in pencil, then inked this in to show the client. 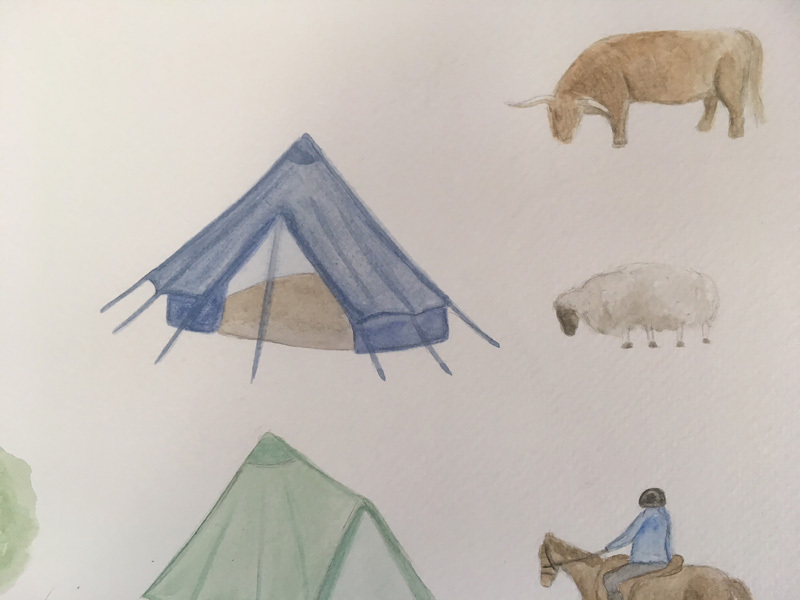 After client feedback we drew the map on watercolour paper and illustrated with watercolour paint. This was then scanned into Adobe Illustrator where the finishing touches were added to the map. All points of interest are highlighted on the map including a glamping site. 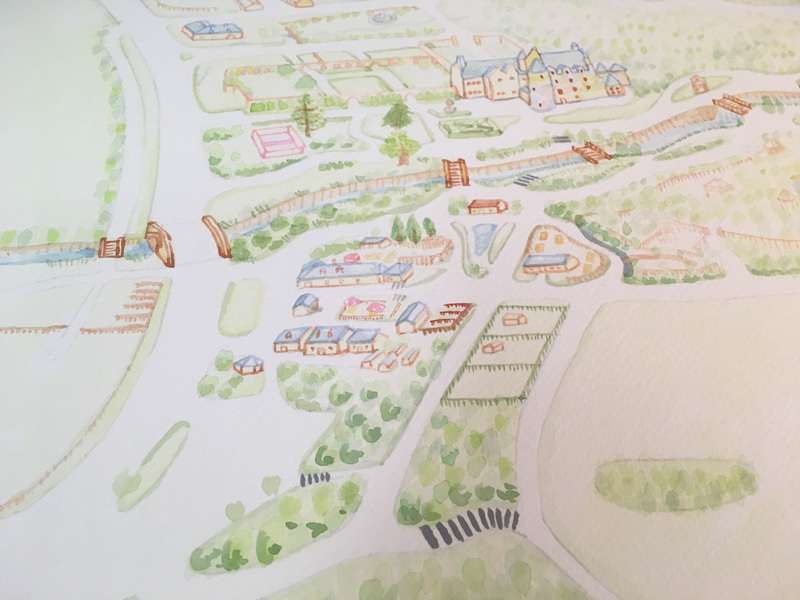 The close feedback with the client throughout the process culminated in a beautiful illustrated watercolour style map that showcases Kelburn Estate and all that is has to offer. With this project we supplied artwork at A1 for interpretation boards as well as three versions of the artwork, high resolution for printing, an email version and web version for putting onto the business website. We were looking for a large map to be the feature of our new office on the north Norfolk coast. We met Caroline on site when the building was still under renovation and she very quickly understood what we were looking for. She worked to a tight schedule and helped us to create a map that really embraces our brand guidelines and has the WOW factor that we were hoping for. Caroline and her team were very easy to work with and we are delighted with the end result.